M-SEAL is a hard wearing, durable sealer and paint. Formulated to protect and seal, floors, concrete, wood and stone internal finishes. 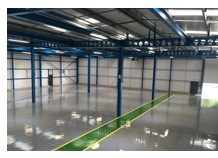 M-SEAL is ideal for factory, garage and workshop floors. Provides a hard wearing, tough finish to protect against the damaging effects of petrol, oil, grease, acids, alkalis, sugars and detergents. M-SEAL does not discolour with age and prevents efflorescence and blooming. Needs no buffing. Prevents dusting and eliminates water absorption providing a high standard of hygiene. Available in Red, Light Grey, Grey and Green. Covers up to 10 sq. metres per litre depending on the porosity of the surface. Under normal conditions, touch dry in 6-8hrs, fully cured in 24hrs. Apply to clean dry surfaces. Ensure any oil or grease deposits are removed. On new concrete, allow the surface to mature for at least a month prior to sealing. Certain surfaces may need acid etching using MDCO ACID ETCH. Apply with a roller or brush. White Spirit may be used for thinning.